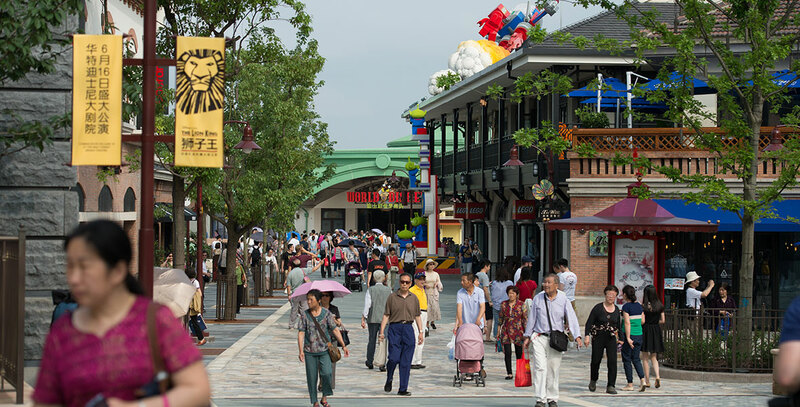 Disneytown Shopping, dining, and entertainment district at Shanghai Disney Resort; opened June 16, 2016. On the shore of Wishing Star Lake, guests find a timeless village inspired by both Disney themes and Chinese culture. The five districts include: Marketplace, a bustling central plaza with international shopping; Lakeshore, with waterfront dining; Spice Alley, an eclectic food street; Broadway Boulevard, with elegant shops and galleries; and Broadway Plaza, a theatre district with restaurants and views of the resort, and the Walt Disney Grand Theatre, which premiered with a Mandarin-language production of The Lion King.